I was making a batch of Earl grey cocoa cross shaped macaron shells as one of the items for the dessert table for an event. 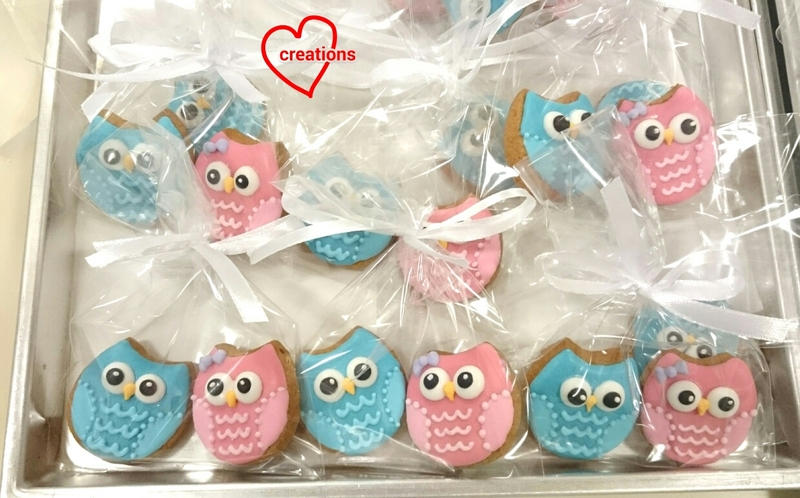 I couldn't resist the chance to use some of the batter to make these for my kids who have been badgering me to make something Earl grey flavoured for them! I made only 3 of each but will type out the recipe as if it were for a bigger batch. 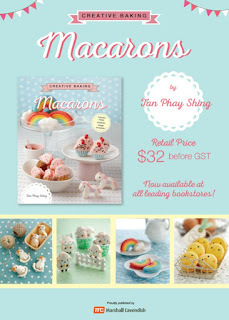 Do checkout my Creative Baking: Macarons book as it brings you through the basics to the various techniques required for creating complex shaped macarons! 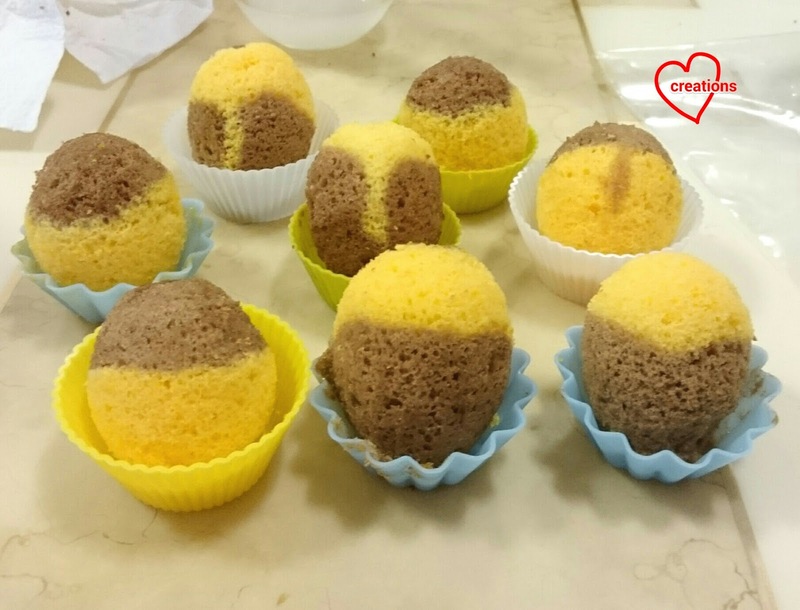 Dark brown: 5g Dutch processed cocoa powder + pinch of charcoal powder + orange and yellow gel food colouring. 1. 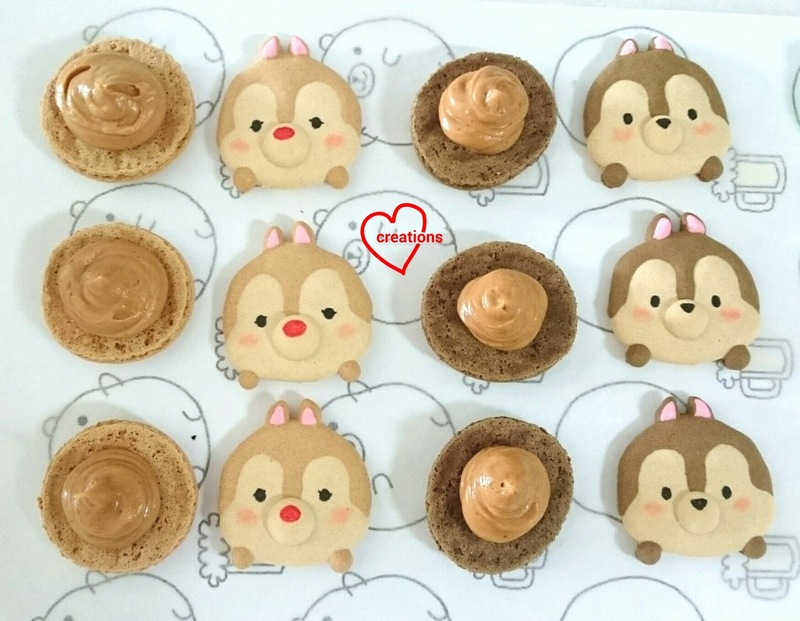 Prepare baking trays with Chip n Dale template under baking paper. Stick the corners of baking paper with Italian meringue when you have made the meringue. 2. Make the mass. Sift almond and icing sugar together in a large mixing bowl. Add 80g egg whites and mix well to form a thick paste. Divide the paste into 3 equal parts. Add food colouring/ flavouring until desired shade is obtained. 3. Prepare the Italian meringue. Boil caster sugar and water in a small saucepan until 115°C. Use a candy thermometer to monitor the temperature. In the mean time, beat the rest of the egg whites in a clean metal bowl at medium low speed until soft peaks form. Do not beat past this stage. Reduce mixer speed if necessary. Once temperature of syrup is reached, remove from heat, turn up mixer speed to medium high speed and carefully pour syrup into egg whites, avoiding the beaters. Continue beating for another 10 minutes until cool, stiff and glossy. Divide the Italian meringue into three equal portions. 4. Macaronage. Fold the Italian meringue into the mass in two additions until the consistency is like slow-moving lava. The first addition is about a third of the meringue. 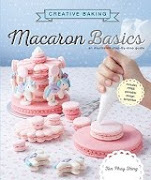 You may refer to this post for video tutorials of the macaron basics. 5. Transfer the batter into piping bags fitted with round piping tips of appropriate sizes. Use a toothpick to nudge the batter into place where necessary. 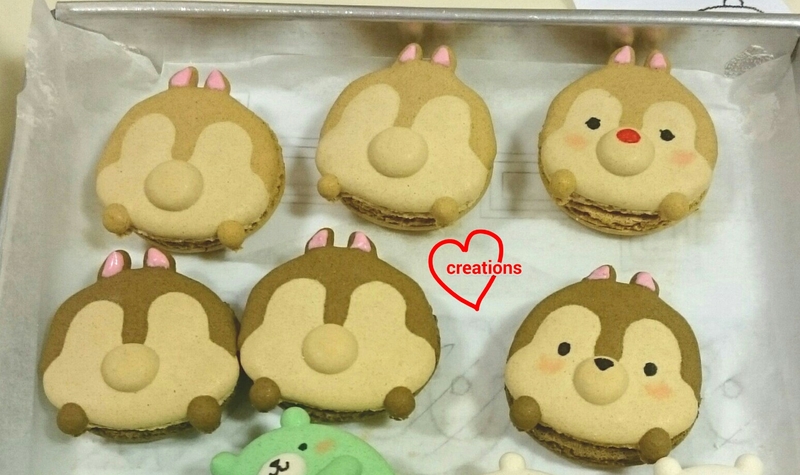 You may refer to this post for video tutorials on how to pipe complex shaped macarons. Bang the tray hard on the table top a few times to release trapped air bubbles. 6. Let the shells dry under a fan or in an air-conditioned room until no longer sticky to touch. About 1-2 hours, depending on humidity. Preheat oven to 140°C towards end of drying time. Set oven rack to lowest position. 7. Bake for 17-20 minutes, rotating the tray halfway through baking. If the feet of the shells still appear wet, bake for another 5 minutes at 115°C. Cool completely before peeling the baking sheet away from the shells. 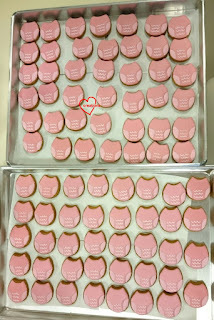 Freshly baked and starting to decorate with royal icing, edible marker and lustre dust! 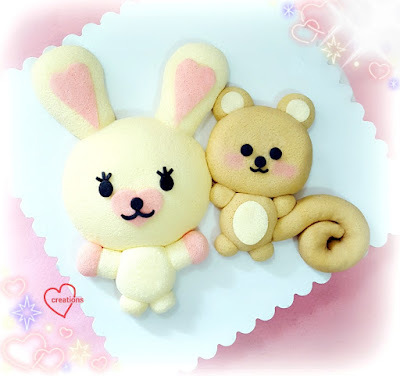 Yes I was baking some bears concurrently as well! I chose to use a ratio of 3:1 for white chocolate : cream + butter for a firm ganache. You may play around with this ratio or replace the butter with cream if you want a softer ganache. * you may infuse 3 Earl grey tea bags in hot heavy cream if you are unable to obtain Earl grey tea powder. Prepare about 60g of cream instead and steep teabags in hot cream for 5 minutes. Squeeze out the bags and measure out 45g of Earl grey infused cream. 1. 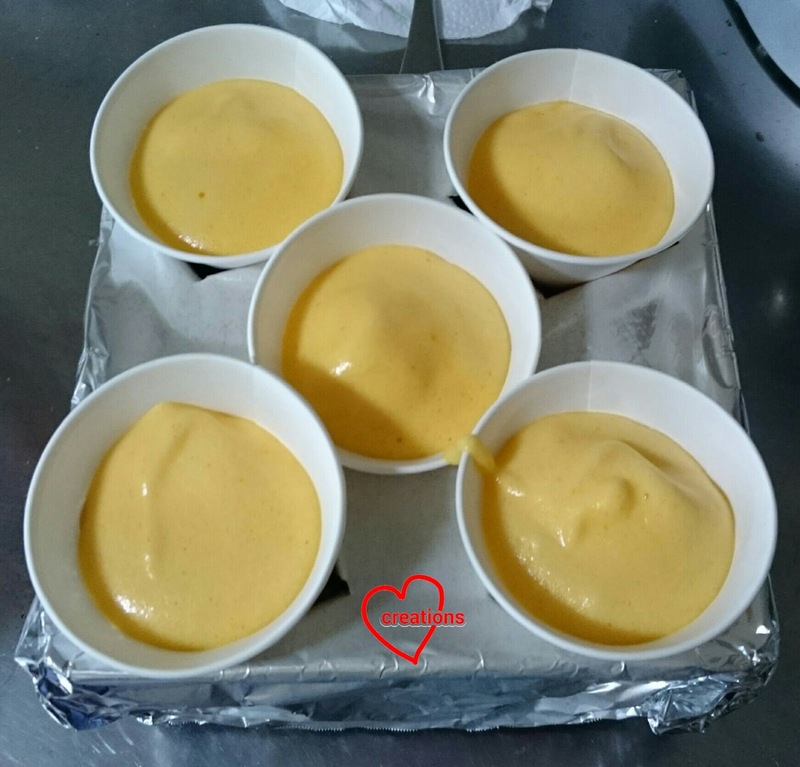 Place chopped white chocolate and butter in a microwave safe bowl and melt using medium power in 10-20 seconds heating cycles, stirring well in between. 2. 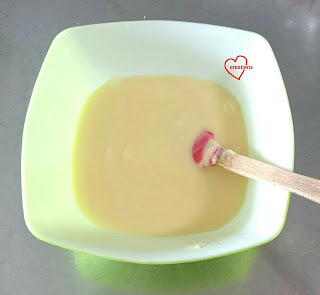 Place cream in small saucepan and heat over low heat until it starts to bubble. Remove from heat and pour over melted chocolate. 3. 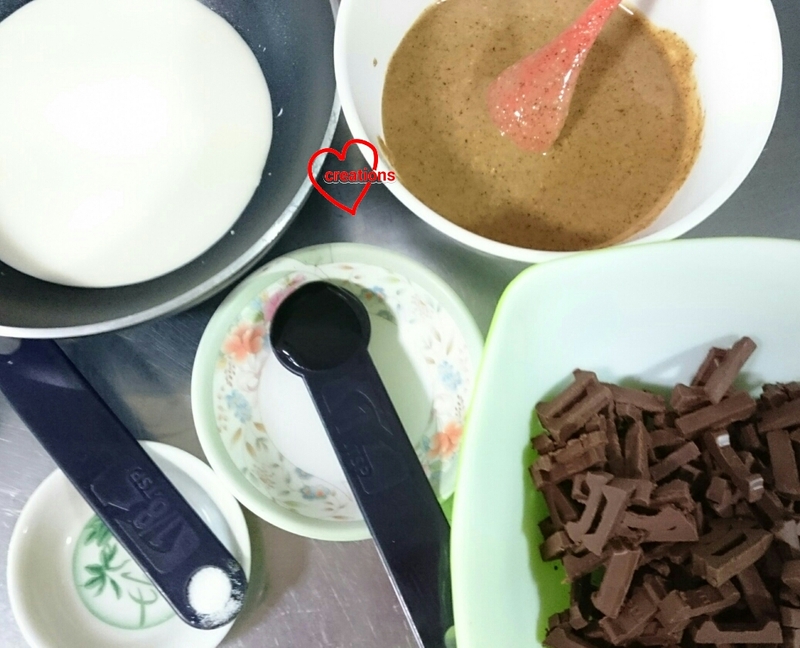 Use a spatula or whisk to mix the cream into the melted chocolate, stirring in one direction until well combined. 4. Gradually add sifted tea powder and mix well. Add salt and vanilla and mix well. Adjust amount of tea powder according to taste. 5. Chill the ganache for about 10 minutes in the fridge. Use an electric mixer, hand whisk or spatula to whip the chilled ganache for a couple of minutes until texture lightens up. If you prefer a denser filling, you may skip this step and use the ganache once it firms up to toothpaste consistency after sitting at room temperature for half an hour to an hour. Whipped Earl Grey White Chocolate ganache! 6. Transfer to piping bag and pipe onto shells. Sandwich the shells and refrigerate for half an hour or overnight. This ganache is firm enough to leave the macarons in cool air-conditioned room temperature for a few days. Perfect as gifts :). If you are storing them in the fridge, leave them out at room temperature for 15 minutes before serving or the ganache will be too firm to eat. Take a peek at the insides! 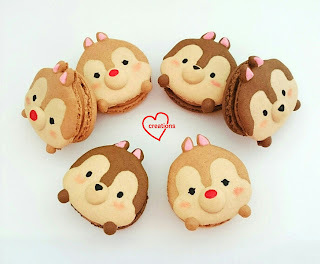 I only get to take these photos when my kids eat the macarons! Excuse the blur image. My kid's hand was shaking. Can't wait to eat the macarons! Strong flavour without being too sweet! The Earl grey makes the whole package fragrant but less sweet. I made this filling because I have the privilege of making some macarons for the staff of Marshall Cavendish and Earl grey flavour was requested. 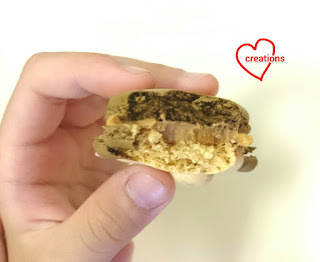 They were very well received so do give this recipe a try if you are looking at not-so-sweet macarons that need to stay out of the fridge for a few days. Happy birthday to my dearest Charissa! She turns 2 years old today! I thank God for this sweet cute little bub who brightens up my day! This cake was inspired by a picture shared by a friend.. when she saw it, she said she wants ‘Tabeet’ =D. So she got her rabbit cake! It was a joint celebration with my SIL, so I made another squirrel, one for each of them! =) I tried out Coconut Chiffon Cake this time as coconut butter cookies posts by Enne Ty and other coconut posts recently really got me salivating! The coconut chiffon cake is yummy (to me =p)! I used reduced egg yolks for whiter cake for the rabbit. 2. Beat egg yolks with sugar with whisk till pale yellow before stirring in oil, coconut milk and vanilla extract. 5. Gently fold meringue into egg yolk batter 1/3 at a time. 6. 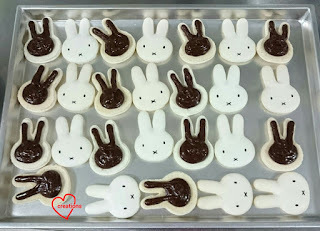 Pour the batter into a ball cake pan till ½ full (for rabbit head), small glass bowl (for rabbit body), 2 cake pops (for ears) and into a 23-cm baking paper-lined baking pan (swissrolls for ears and arms). *You can also use this recipe for a normal 7-inch tube pan. Fill the pan leaving 2-cm from the rim. 7. Bake the ball cake pan and small glass bowl at 160°C for 15 min then 140°C for 15 min. 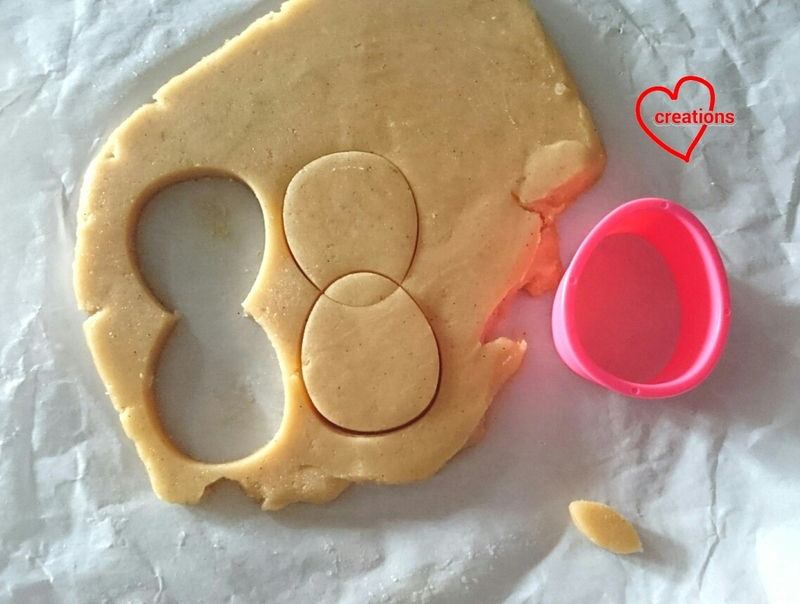 Bake the cake pop mould and 23-cm baking pan at 160°C for 12 and 15 min respectively. Invert ball cake pan and glass bowl to cool. Leave the rest upright to cool. *If you are using this recipe for a normal 7-inch tube pan, baking temperature as follows 160°C for 15 min then 140°C for 30 min. 8. 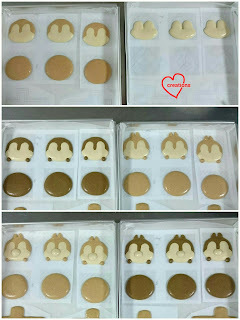 Unmould by hand after cakes have cooled completely. *Remember to roll up the 23-cm layer cake while cooling to prevent cracking later. Same recipe is used for squirrel except 1/3 tsp cocoa powder is added for the brown colour. 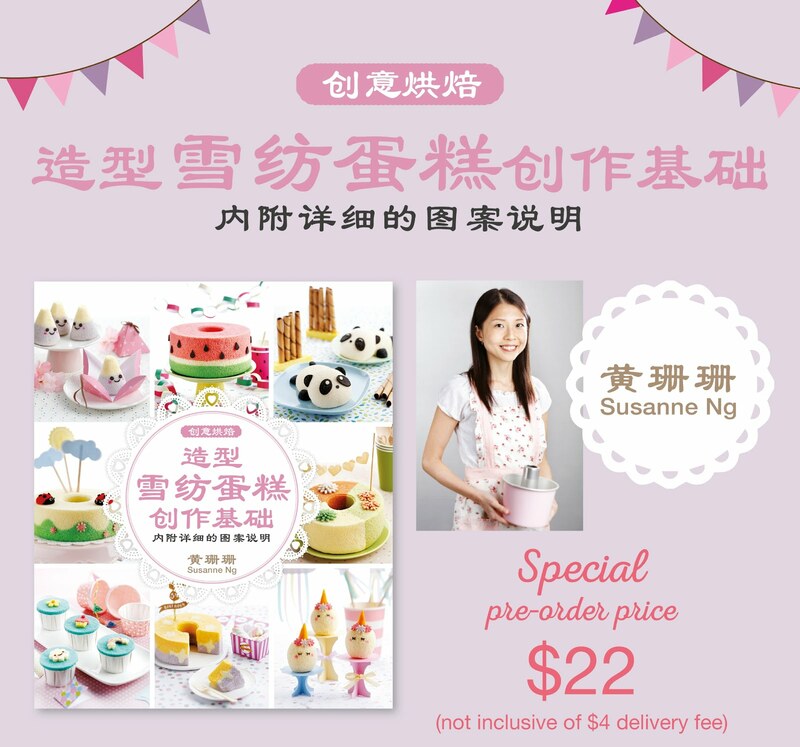 Bake the face in an oval glass bowl for face (160°C for 15 min then 140°C for 10 min, small glass bowl (as above), 6 cake pops (as above), and 23-cm baking paper-lined pan for the curly tail (as above). 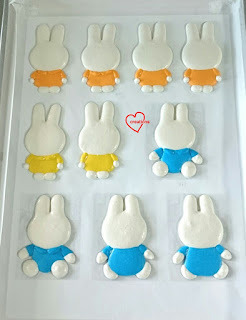 In addition, I baked 3 sheet cakes using recipe as above. Divide egg yolk batter into 3 parts. Add ½ tsp charcoal to one portion, a dip of pink gel colouring to another portion, and leave last portion untouched. Bake the black, pink and white layer cakes in 23-cm baking pans for cutting out features. Spoon 2 tsp pink batter into cake pop moulds for the hands. Do they look happy like they are bouncing on the cloud? Thank God all the kids loved the cute cakes! The kids were fighting over the which part to eat hehe. Very rarely this happens but it did. 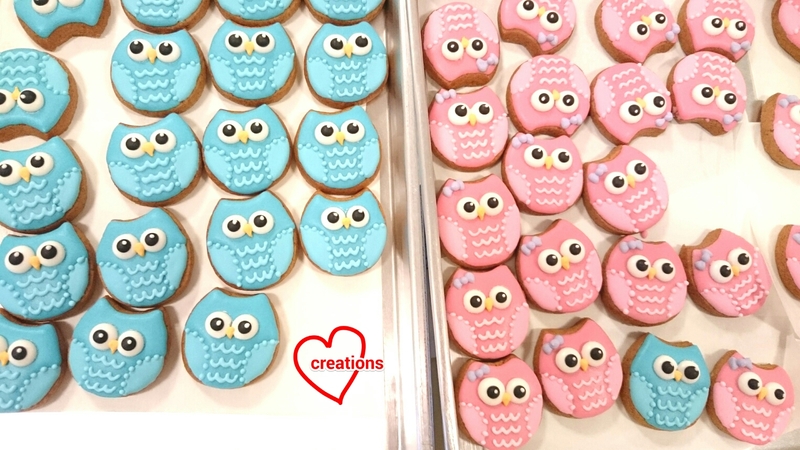 I have two similar requests around the same time for owl cookies so here they are! 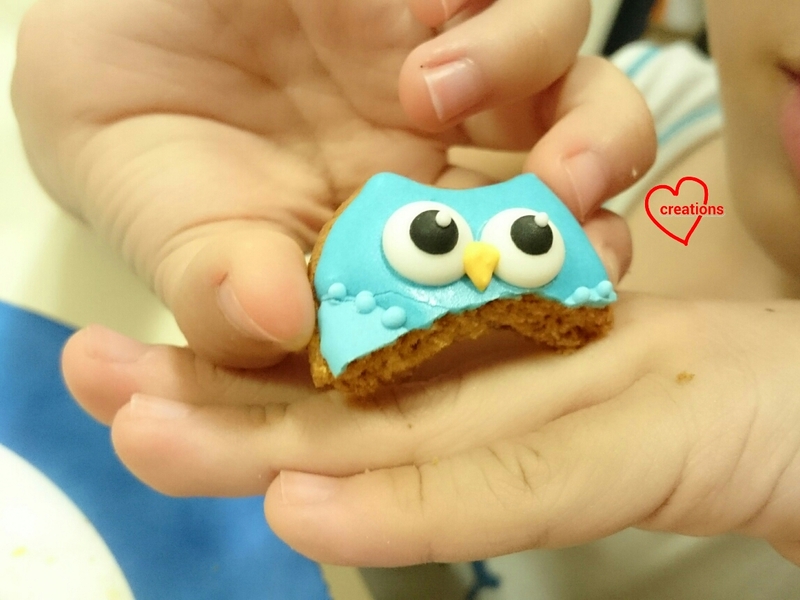 Using an egg shaped cutter about 3cm tall to cut out the owl cookie base. ... But to ice all 115 of them was no joke! It took me two and a half days of intensive icing to complete. Day 3! Finally done! My hands were unsteady by the end of it! 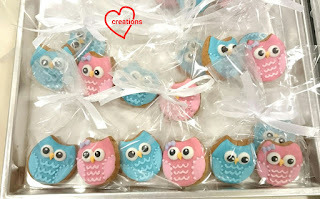 Recipe for brown sugar cookies and royal icing can be found here. 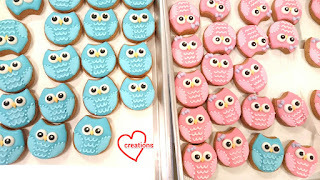 The recipe is very forgiving and I tend to overbake a little so that the cookies don't soften too much after icing. 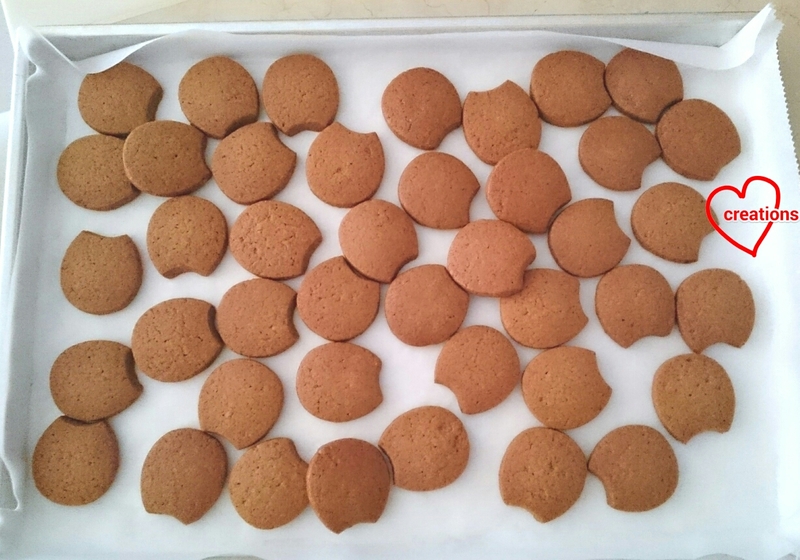 As these cookies are small (3cm), I baked at 160°C for 13-15 min. Use your eye to judge for doneness. When cookies are cooled, they should feel firm when you press with your finger. 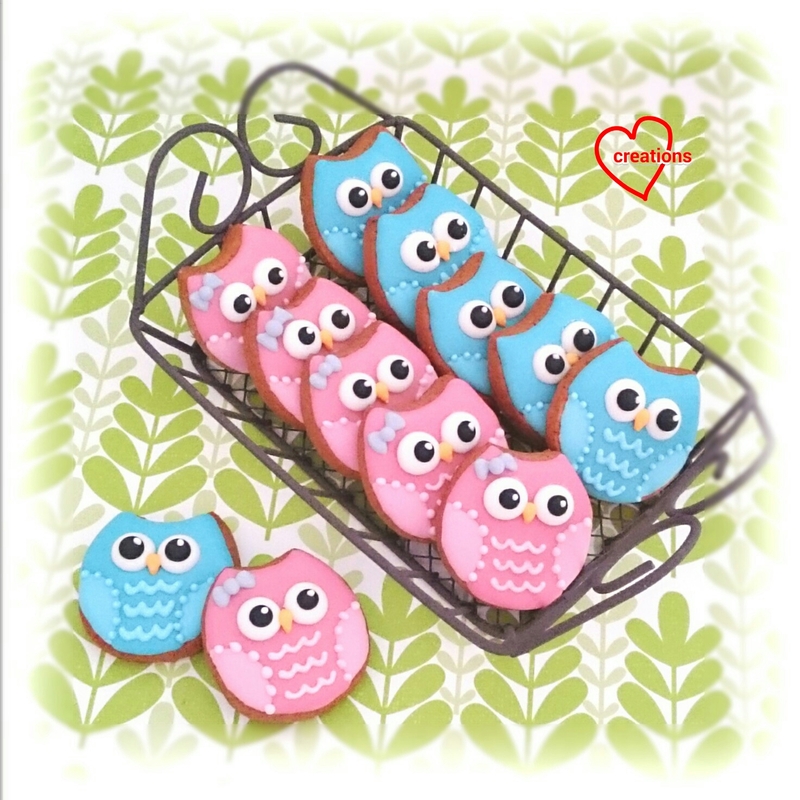 If they are still soft, bake for 5 minutes more or until the cookies feel firm when you press the surface gently. 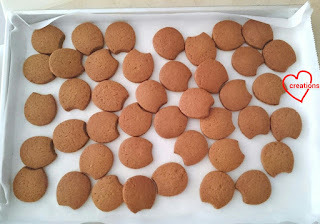 Nicely baked brown sugar cookies meant for icing should be nicely browned (not burnt) and firm. My brown sugar cookies always get rave reviews. 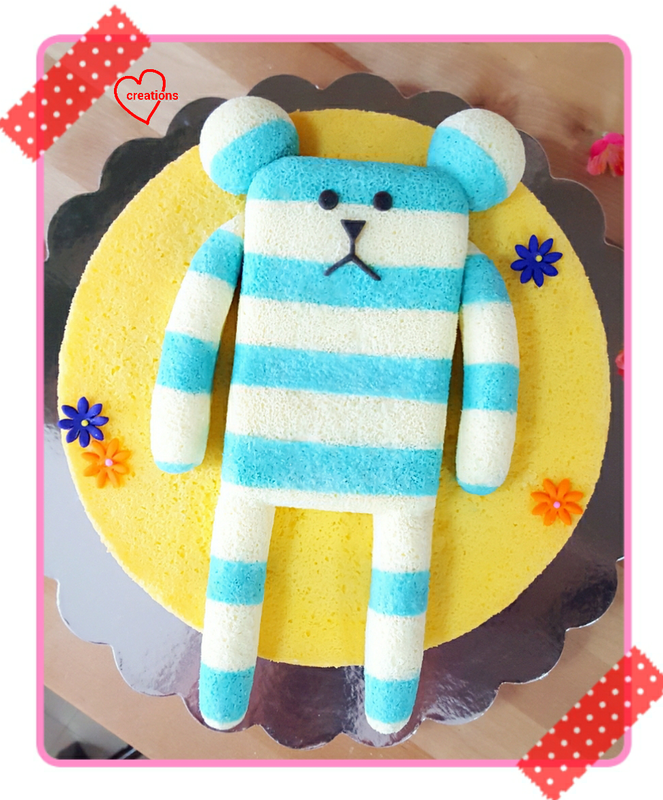 This Craftholic chiffon cake was made for my mummy friend’s girl who loves the blue Sloth bear, which she affectionately calls ‘Bluey’! The flavour of the base chiffon was Yuzu chiffon cake, which was requested. I personally love Yuzu chiffon very much and it well-received! 1. Make yuzu tea by stirring in 3 tbsp of yuzu marmalade in 108 ml hot water. Filter the tea to remove the bits. 2. Preheat oven to 160°C. Prepare a tray of water under the lowest rack for steambaking. *Optional but helps to increase moisture for ogura-like texture. 7. Pour the batter into a chiffon tube till batter is 2 cm from the top of the tin. Gently tap the tin on the counter lightly to remove air bubbles. 8. Bake the chiffon cake at 160°C for 15 min, at 150°C for 10 min, then at 140°C for 20min, then at 130°C for 15+ min, or until skewer inserted into centre of cake comes out clean. 10. Unmould the chiffon cake by hand (‘Hand Unmoulding Chiffon Cake for a Clean Finishing’ video tutorial). For the Craftholic Sloth bear, I use recipe for Vanilla chiffon cake (with reduced egg yolks) and piped blue and white lines in a rectangular glass dish, a baking paper-lined 10-inch tray and in 2 cake pops. I made swissrolls from the 10-inch sheet cake for the limbs. Divide the egg yolk batter into two. Add a dip of wilton blue gel to one portion. Pipe horizontal lines in a rectangular glass dish, in a baking paper-lined 10-inch tray (for the limbs), and in 2 cake pops (for the ears). Bake dish and tray at 160°C for 15 min and cake pops for 12 min. Roll up the 10-inch sheet cake while cooling to prevent cracking. Divide the 10-inch sheet cake into 4 and roll up each portion into a swissroll for the limbs. Join up the ears and limbs to the body. I hide a special surprise in the tube hole and covered with the Craftholic bear! My friend shared her girl kept calling bluey! Thankful it was well-received! 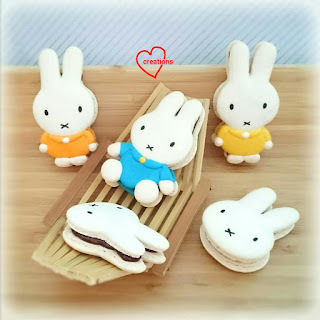 My friend and her cousin are fans of Miffy so here are some Miffy macarons for them :). 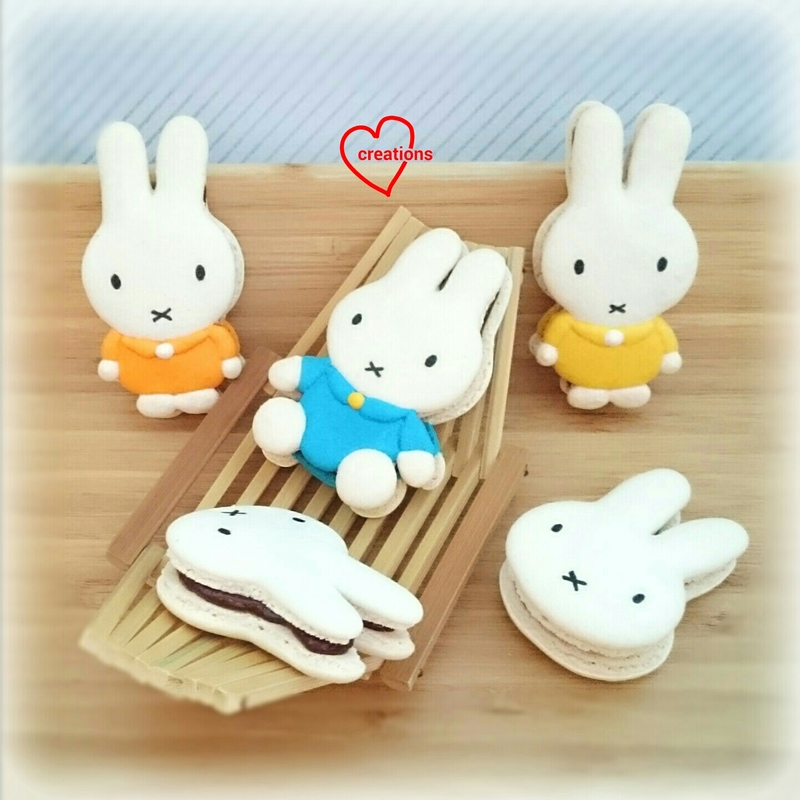 This is actually my second time making Miffy macarons. 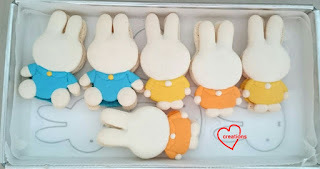 You may take a look at my first attempt at making them last year along with other cute characters in this post. 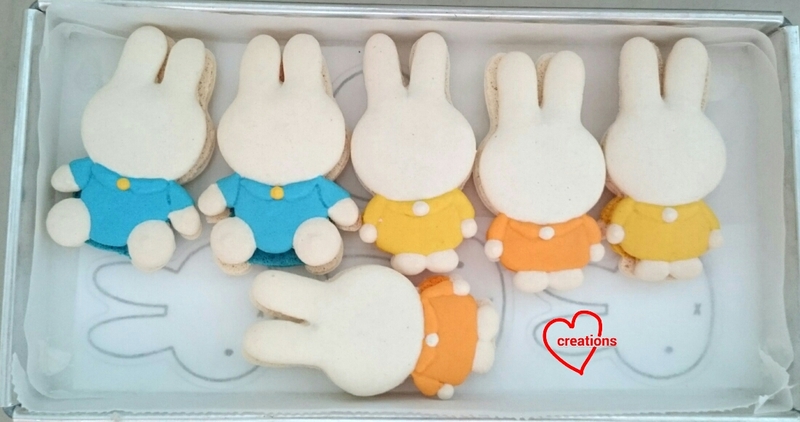 These Miffies are of the same flavour as the Meeple macarons since it's the same friend that requested for them. Hazelnut dark chocolate ganache filling! 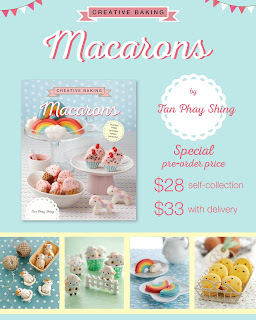 You may refer to my Meeple macaron post for the shell and filling recipe. 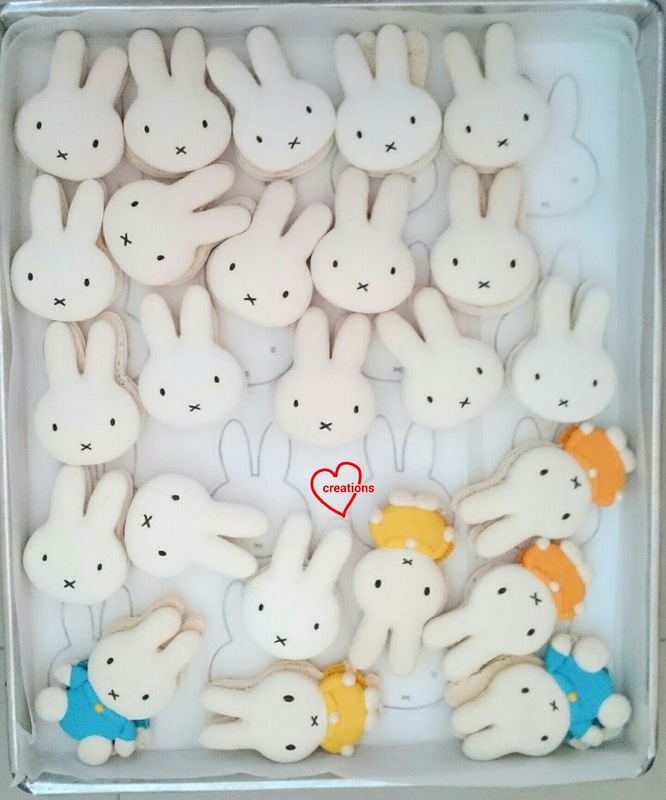 Just note that baking temperature is slightly lower for white Miffy at 130°C to prevent browning. The temperature has to be lowered further to about 115°C after 20 minutes of baking to continue drying the shells thoroughly without browning. Bake with the tray at the lowest rack of the oven. I used edible black marker to draw the face. 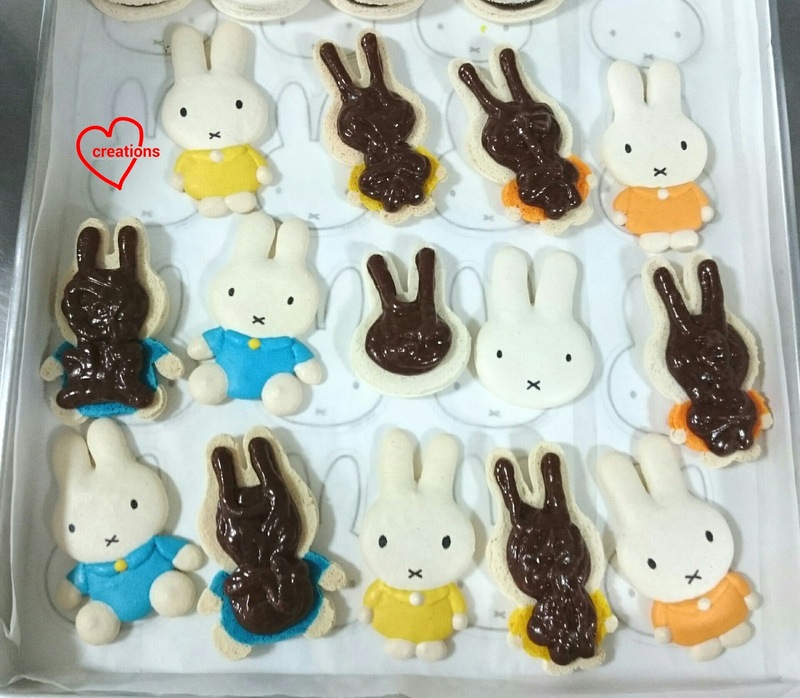 There were smiles and exclamations of "Miffy!!" when these were received :). Thank God that these macarons were very well received in terms of looks and taste! The hazelnut dark chocolate filling is highly recommended as there is no sugar added, perfect to pair with sweet macaron shells. So if you can afford it, do make from scratch. Not too troublesome to make and much better than Nutella! Pre-orders for Creative Baking: Macarons is now open from 10-21 Feb! Don't miss the dates! Here are some pretty rainbows on clouds macarons! 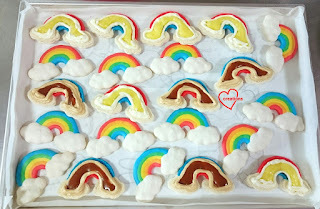 Although no further decoration is required post baking, piping these rainbows require some patience and dexterity. Thankfully a small quantity is requested for these so it was still manageable. I made these rainbows along with Meeples and Miffy macarons. I filled the macarons with lemon swiss meringue butter cream (smbc) and lemon curd or salted caramel smbc with salted caramel center as requested. 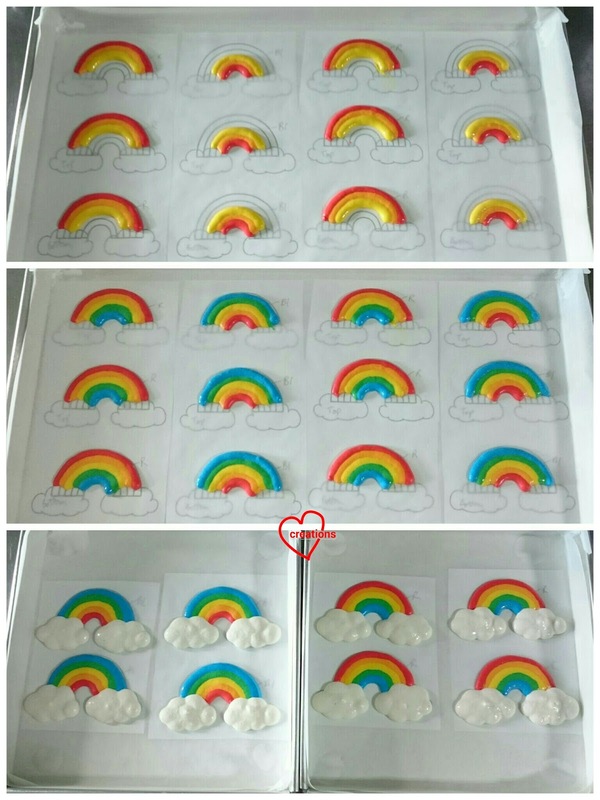 I don't think I can provide the templates for these as I have templates for rainbows and clouds (separately) in my Creative baking: Macarons book. Check out the link at the end of this post for more details of the book! 1. 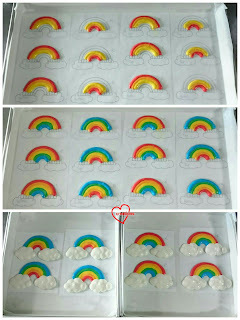 Prepare baking trays with "rainbow on clouds" template under baking paper. Stick the corners of baking paper with Italian meringue when you have made the meringue. 2. Make the mass. Sift almond and icing sugar together in a large mixing bowl. Add 80g egg whites and mix well to form a thick paste. Divide the paste into 1:1:1:1:1:5 for red:orange:yellow:green:blue:white. Add food colouring until desired shade is obtained. I prefer natural sources of colouring but they tend to be dull and insufficient when you need strong and bright colours. 3. Prepare the Italian meringue. Boil caster sugar and water in a small saucepan until 115°C. Use a candy thermometer to monitor the temperature. In the mean time, beat the rest of the egg whites in a clean metal bowl at medium low speed until soft peaks form. Do not beat past this stage. Reduce mixer speed if necessary. Once temperature of syrup is reached, remove from heat, turn up mixer speed to medium high speed and carefully pour syrup into egg whites, avoiding the beaters. Continue beating for another 10 minutes until cool, stiff and glossy. Divide the Italian meringue for the various colours using the formula weight of Italian meringue = 0.55 x weight of mass. 5. 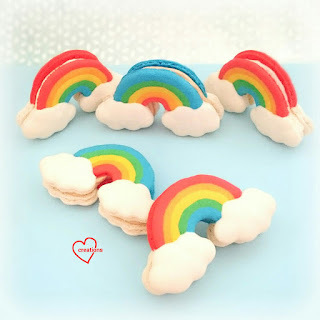 Transfer the batter into piping bags fitted with a Wilton #5 tip for the rainbow colours and #7 tip for the clouds. 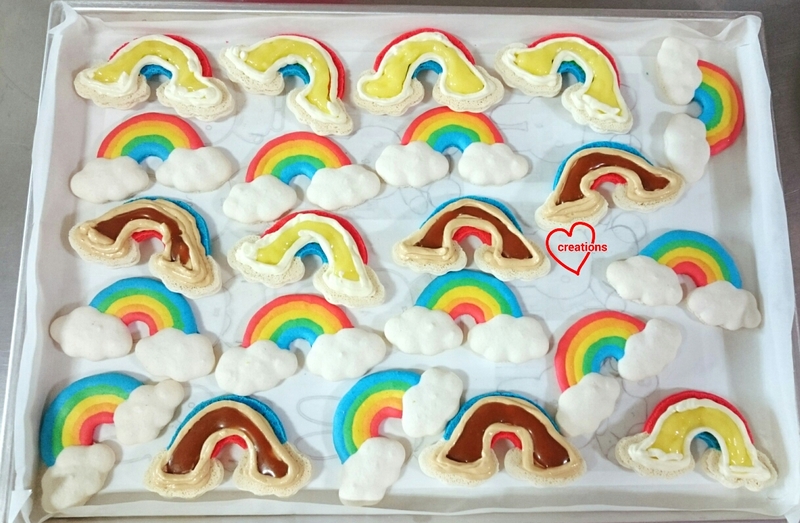 Pipe the rainbows and clouds onto baking trays. Use a toothpick to nudge the batter into place where necessary. 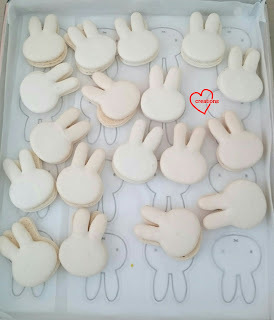 You may refer to this post for video tutorials on how to pipe complex shaped macarons. Bang the tray hard on the table top a few times to release trapped air bubbles. 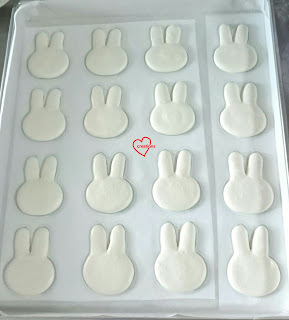 Batter in piping bags! Looks pretty on its own! 6. Let the shells dry under a fan or in an air-conditioned room until no longer sticky to touch. About 1-2 hours, depending on humidity. Preheat oven to 130°C towards end of drying time. Set oven rack to second lowest position. 7. Bake for 18-22 minutes, rotating the tray halfway through baking. If the feet of the shells still appear wet, bake for another 5 minutes at 115°C. Cool completely before peeling the baking sheet away from the shells. 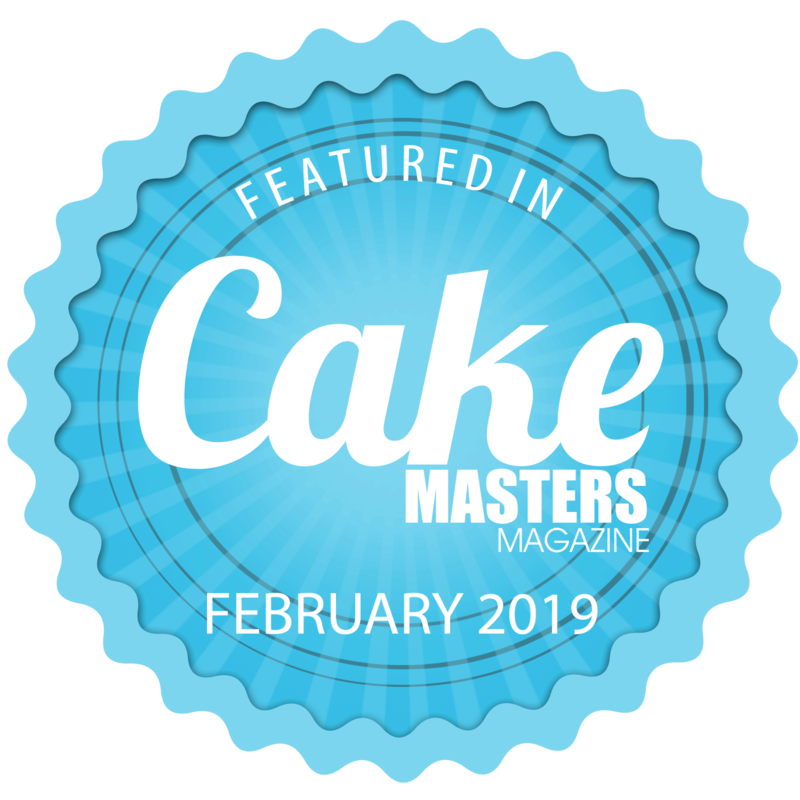 You may refer to this post for salted caramel recipe, this post for lemon curd recipe and this post for the basic vanilla swiss meringue buttercream (smbc). Salted caramel smbc is made by combining 80g of salted caramel for every 100g smbc. Lemon smbc is made by combining 35g of lemon curd for every 100g smbc. Store the filled macarons in the fridge in an airtight container for at least 24h before serving. 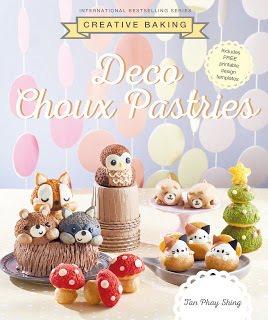 I've been slowing down recently due to the 3 kids and also busy writing up the draft for Creative Chiffon Book 2, titled "Creative Baking: Deco Chiffon Cakes". 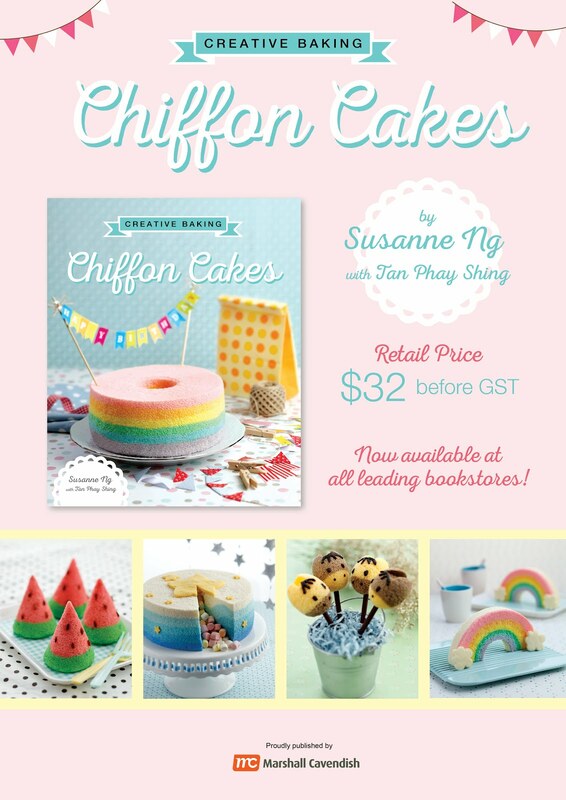 Yes, really very thankful that there will be a Book 2 as the Book 1, "Creative Baking: Chiffon Cakes" is doing well (its second print run will be out in April)! This chiffon cake will be in Book 2 (Deco Chiffon Cakes), so am really sorry there will be a short wait of a few months before recipe is out in full. But for now, you can refer to my older Matcha Ogura Turtles recipe, and Book 1 for simpler waves. I had a friend try out the Turtles recipe above and had good reviews! 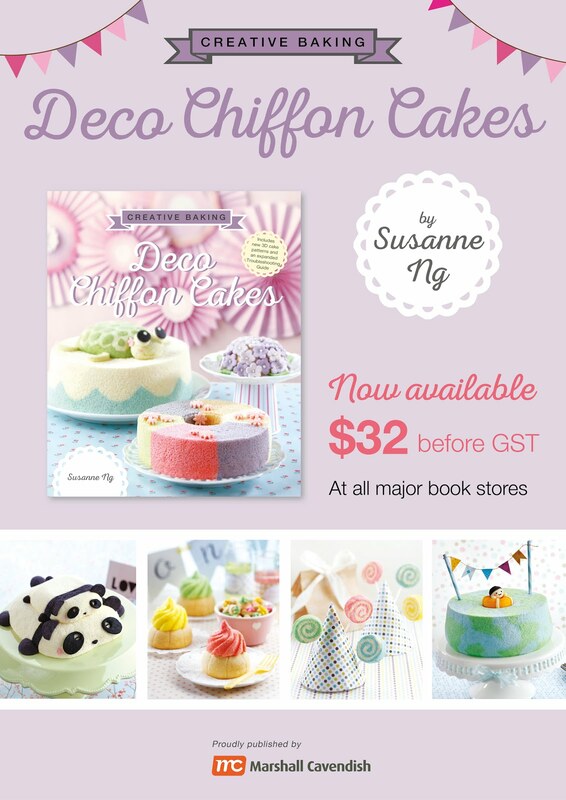 Book 2 (Deco Chiffon Cakes) covers more interesting and innovative 3D patterns on the chiffon cakes (which may actually be even simpler to make than the first book).. and an extended 3-page FAQ section from all the questions I encountered from Book 1... I'm really excited to share more about it later after the photoshoots! This cake is made for my dear friend Christine's daughter Hui En's 2 yo birthday! 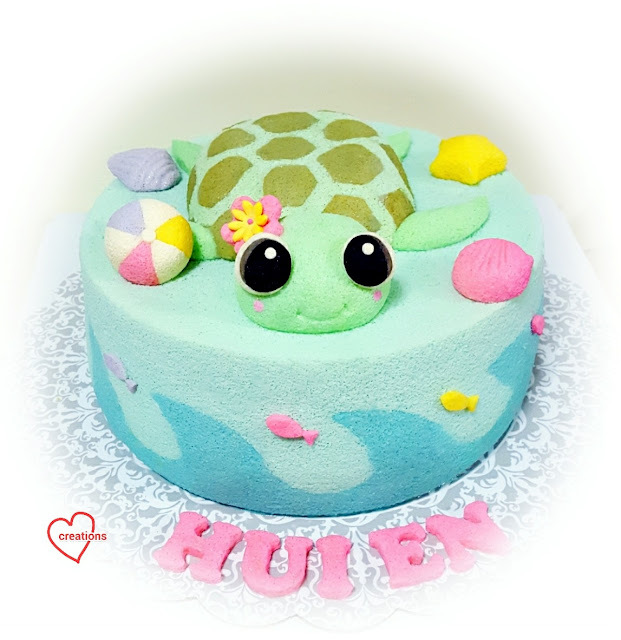 She loves animals especially turtle so the cake was specially designed for her. Thank God the cake was well-received. And she's truly adorable! She got really sad when daddy cut up the turtle lol.. I have never heard of Meeples until I have this request for Meeple macarons. A friend of mine wanted to surprise her hubby who is a fan of this board game for Valentine's Day :). 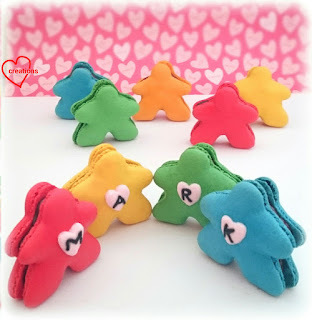 What better way to personalize it than to create the board game pieces with his name on it! Hazelnut dark chocolate flavour was requested. 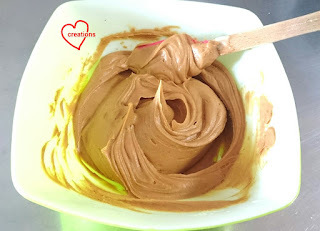 The easy way is to use Nutella but it is not the best way to go if you don't have a sweet tooth as Nutella and other hazelnut spreads you find at the supermarket already have sugar and other additives added. I made the hazelnut dark chocolate ganache from scratch with premium ingredients. You may make your own hazelnut butter but I didn't want to add in extra work for what is already quite and involved bake. 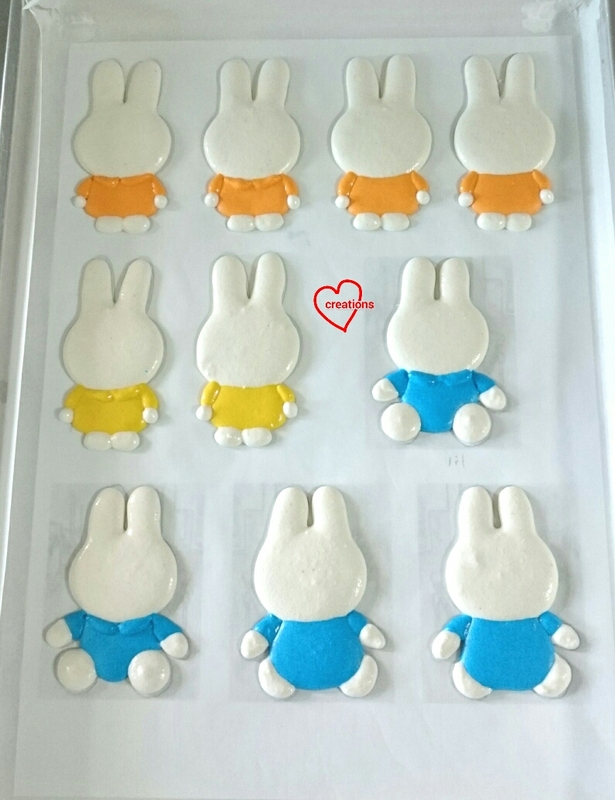 I baked some Miffy and rainbow macarons along with the Meeples. Keep a lookout for those in the near future. 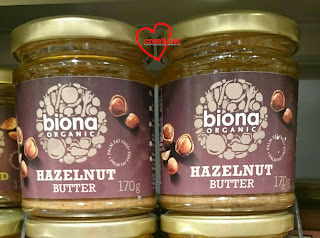 Here's the hazelnut butter I used. I must warn you that a small jar like this costs a lot. Thankfully my friend is willing to pay for it :p.
1. 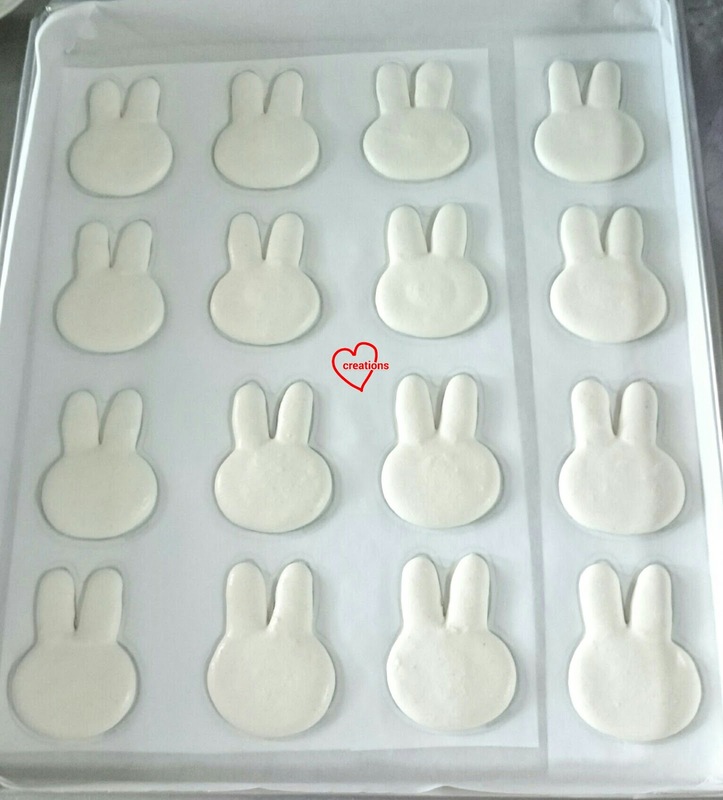 Prepare baking trays with Meeple template under baking paper. Stick the corners of baking paper with Italian meringue when you have made the meringue. 2. Make the mass. Sift almond and icing sugar together in a large mixing bowl. Add 80g egg whites and mix well to form a thick paste. 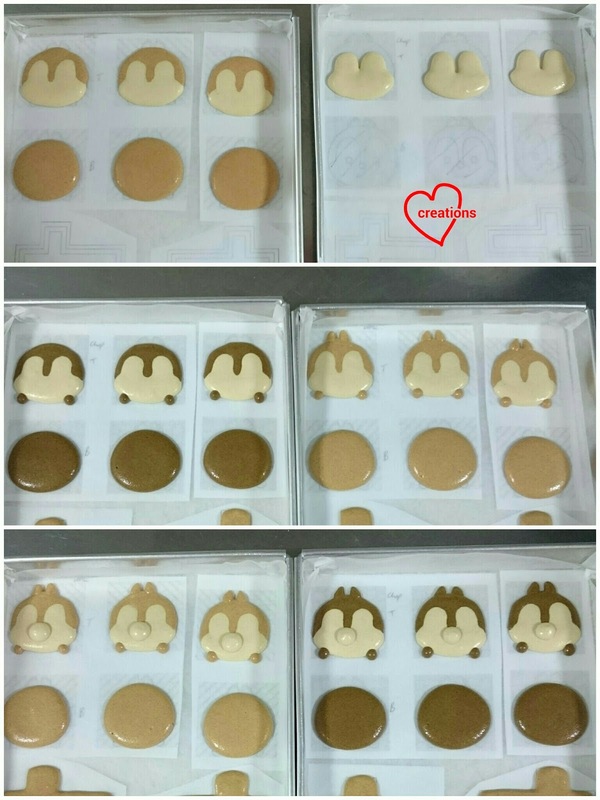 Divide the paste into as many equal portions as you would like for the different colours. Add food colouring until desired shade is obtained. I prefer natural sources of colouring but they tend to be dull and insufficient when you need strong and bright colours. 3. Prepare the Italian meringue. Boil caster sugar and water in a small saucepan until 115°C. Use a candy thermometer to monitor the temperature. In the mean time, beat the rest of the egg whites in a clean metal bowl at medium low speed until soft peaks form. Do not beat past this stage. Reduce mixer speed if necessary. Once temperature of syrup is reached, remove from heat, turn up mixer speed to medium high speed and carefully pour syrup into egg whites, avoiding the beaters. Continue beating for another 10 minutes until cool, stiff and glossy. Divide the Italian meringue into the number of portions of coloured masses accordingly. 4. Macaronage. Fold the Italian meringue into the mass in two additions until the consistency is like slow-moving lava, with the first addition about a third of the meringue. You may refer to this post for video tutorials of the macaron basics. 5. Transfer the batter into piping bags fitted with a Wilton #10 tip (around 5-6mm diameter will do). 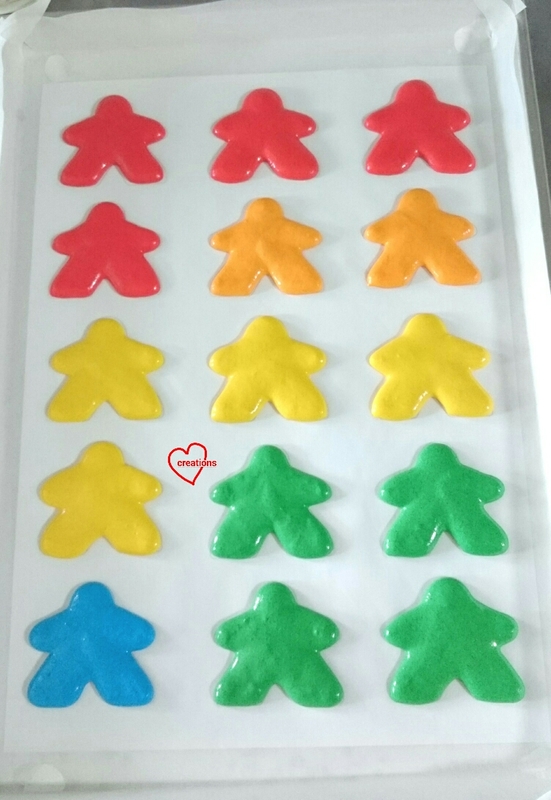 Pipe the Meeple figures onto baking trays. Use a toothpick to nudge the batter into place where necessary. You may refer to this post for video tutorials on how to pipe complex shaped macarons. Bang the tray hard on the table top a few times to release trapped air bubbles. Notice how the piped figures look smoother for red and rougher for green because I piped the red ones earliest. 6. Let the shells dry under a fan or in an air-conditioned room until no longer sticky to touch. About 1-2 hours, depending on humidity. 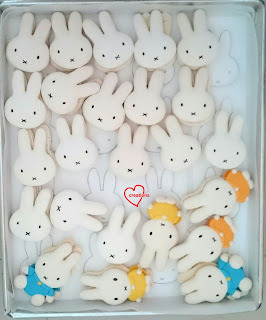 Preheat oven to 135°C towards end of drying time. Set oven rack to second lowest position. 7. Bake for 17-20 minutes, rotating the tray halfway through baking. If the feet of the shells still appear wet, bake for another 5 minutes at 120°C. Cool completely before peeling the baking sheet away from the shells. Shells that are stuck to the baking sheet are underbaked. 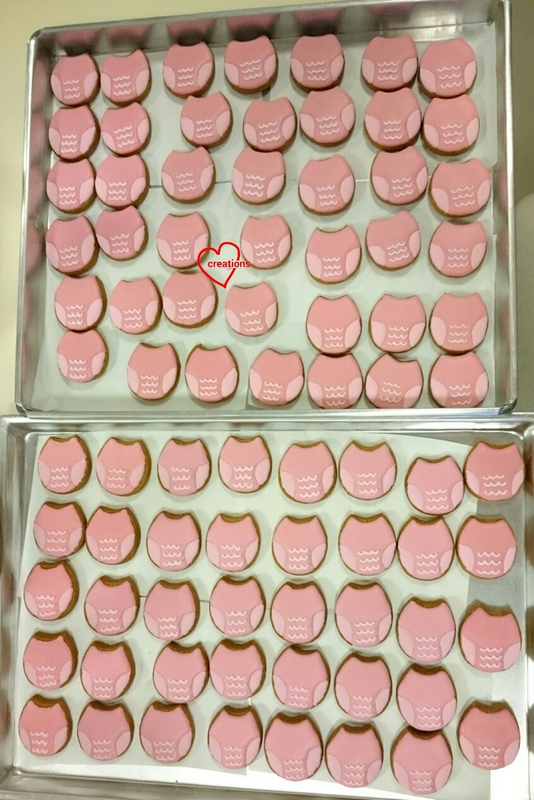 You may prepare some royal icing to personalize the Meeple game pieces if you like. Let the icing dry completely before filling the shells. All good stuff! Smells heavenly already! 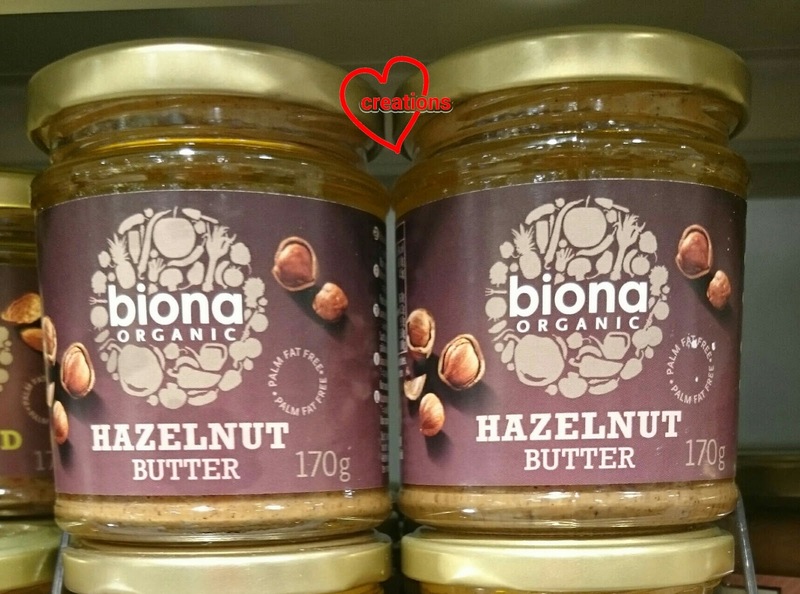 *You may substitute with other nut butters like peanut, cashew and almond butter. These are cheaper than hazelnut butter :p.
1. Place dark chocolate and salt in a microwave safe bowl. Heat on medium heat in 20 second bursts, stirring in between heating cycles until chocolate is melted and smooth. 2. Heat cream in a small saucepan over low heat until it starts to bubble. Add hazelnut butter and stir until well combined over low heat. Remove from heat and stir in vanilla bean paste. 3. Gradually add hazelnut mixture into melted chocolate and whisk until well combined and the consistency of the mixture firms up. Unlike normal chocolate ganaches that firm up when you let it sit untouched, this hazelnut chocolate ganache firms up when you stir it. You may choose to use an electric mixer to beat at low speed for couple of minutes if you like. The resulting consistency should be a like toothpaste. 4. 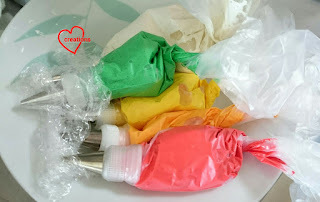 Transfer to piping bag and pipe onto shells. Refrigerate for at least 24h before serving. I originally had a request for 20 horse cupcakes but it became 30. 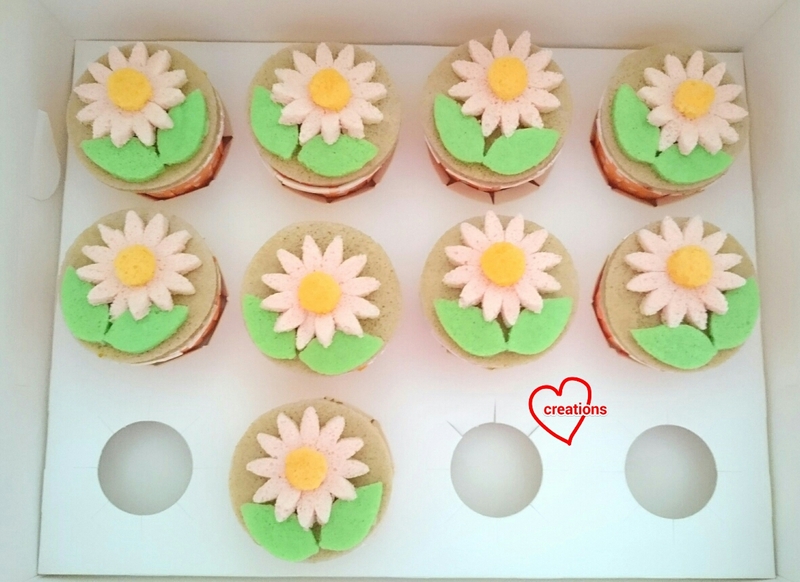 Unlike the usual cupcakes decorated with cream and/or fondant, 3D cupcakes made entirely out of soft chiffon sponge has to be patiently and painstakingly assembled. So I managed only about 21 horses and topped up the rest with simpler cupcakes. Here are some of the horses :). Sitting snugly in cupcake cases! Orange and Milo flavour was requested. These horses are adapted from the orange Milo chiffon horse cakepops that I made two years ago. 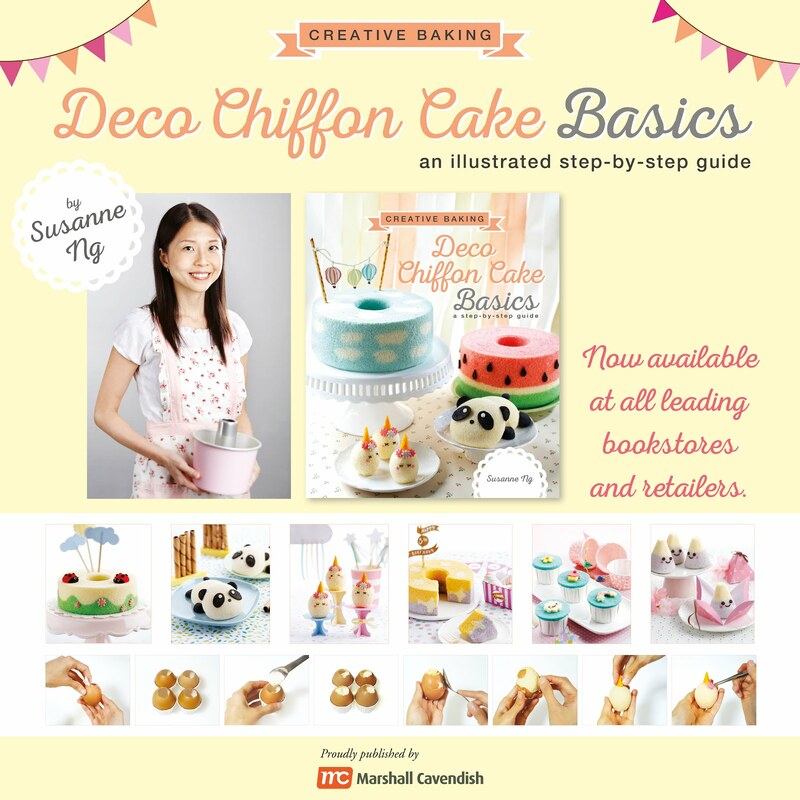 The details of shaping the horse head can also be found in our newly launched Creative Baking: Chiffon Cake book. You may refer to my post for monkey milo chiffon cupcakes for the Milo chiffon cake recipe and detailed baking steps. Prepare the same amount of batter for both flavours. You may want to reduce the amount of zest in the orange flavoured cake to prevent the cake from looking too speckled, about 1/2 tsp. If you don't mind the speckling by all means add more zest for a stronger flavour :). Filling batter in egg shells for the horse heads. Filling paper cones with batter for the horse bodies. Baking time is about 5 minutes longer than egg shell baked cakes. 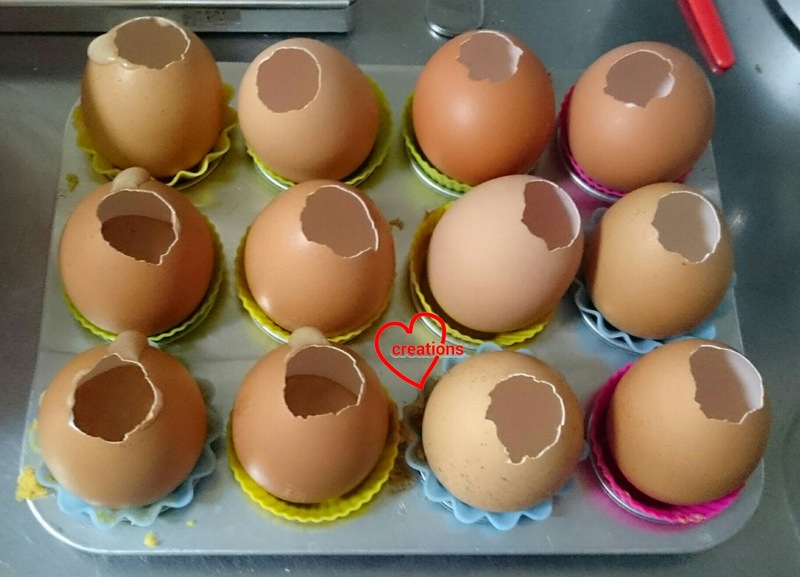 Freshly unmoulded egg shell baked cakes. 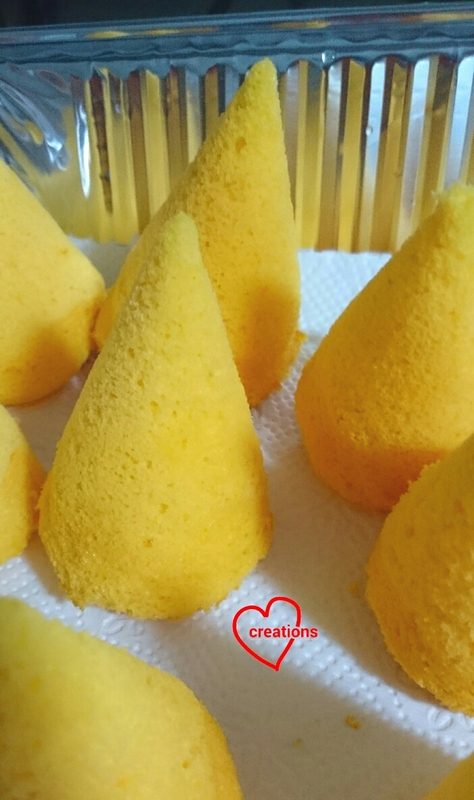 Freshly unmoulded cakes baked in paper cones. 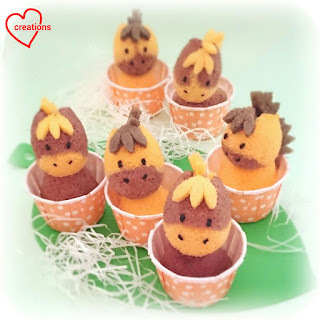 Assemble the horses by using a cakepop stick to attach the heads to the bodies. 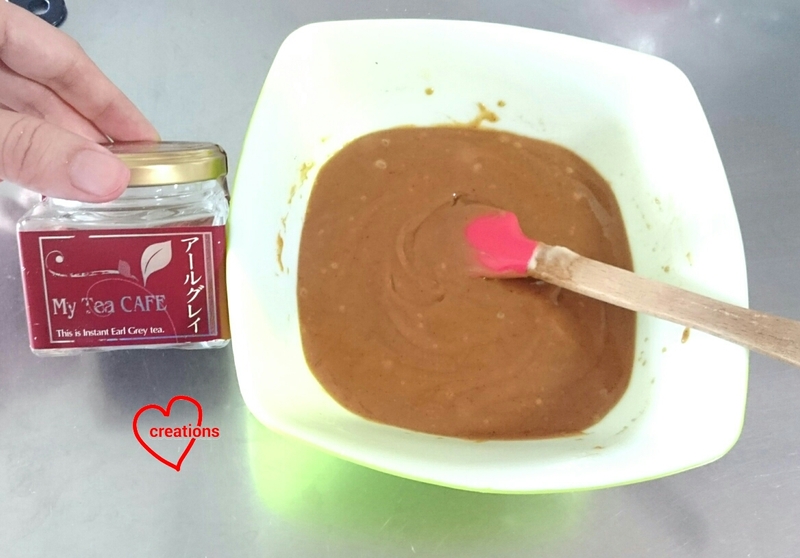 Use cocoa powder dissolved in hot water to make a paste for the eyes and nostrils. I used extra layer cakes for adding on the mane instead of using melted chocolate as mentioned in the chiffon cake book. Remember to brush the surface of the cupcakes with some vanilla or orange flavoured syrup (10g sugar dissolved in 25ml hot water + 1/2 tsp vanilla/orange extract). Store in airtight container in the fridge for up to 3-4 days. 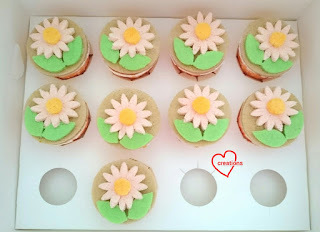 Here are the extra simple cakes that I made :). Thank God that the cupcakes were very well received by kids and teachers! Some kids even asked for second helping!